Knoco stories: Which type of organisations have the best KM culture? Which type of organisations have the best KM culture? Here is another interesting result from our 2014 KM survey. One of the questions was asked people was to identify which, from a list of 10 cultural factors, were the biggest barriers to KM. 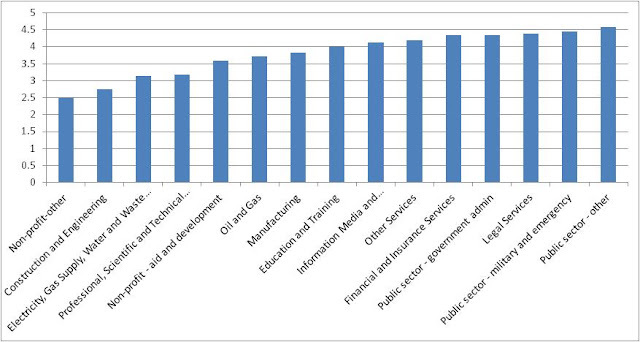 This allows us to do a number of things - to find out the most common cultural barriers to KM, and also to see which industry sectors have the greatest number of identified barriers. The answer to this second question is in the plot below. The greatest number of cultural barriers are found in the Public Sector, the Military, and Government Admin. The fewest cultural barriers are found in the Not-for-Profits and in Construction. Professional Services being low on the list - that also have been doing KM for ages, and know very well that Knowledge is their only product, and that they had better manage it well. What about you, reader? Does this plot surprise you?